Today is Gear Friday. On gear Friday, I will feature the gear I used for the whole week. 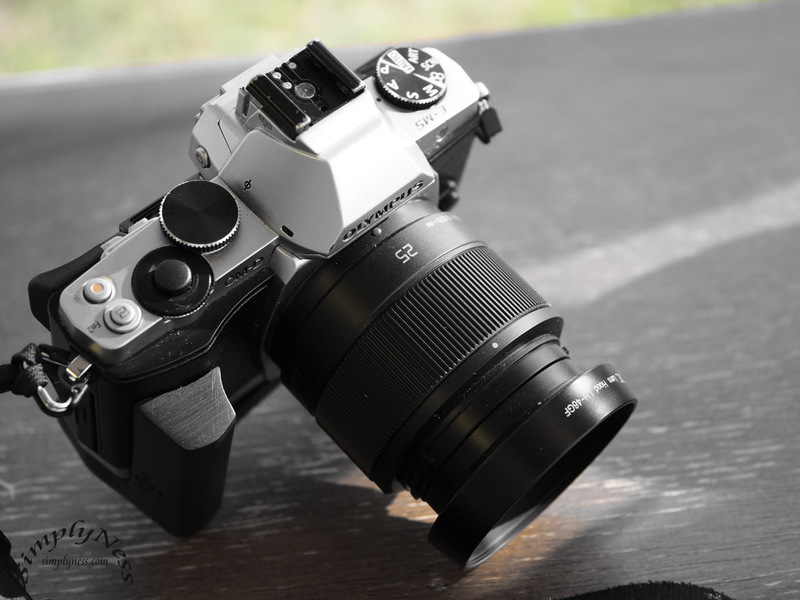 For this week I used my Olympus OM-D E-M5 with the Panasonic Lumix 25mm F/1.7. I bought my OM-D E-M5 almost a year after it was release to replace my aging PEN E-PL1. Boy, it was love at first site, the camera was gorgeous. I got the silver version because it looks more vintage (at least to me) than the black version. I like using the Panasonic Lumix 25mm F/1.7 with it. This camera and lens combination is the camera that is always with me plus one additional lens, the Lumix 14mm F/2.5, in cases I need a wide angle lens. Before I got the Lumix 25mm F/1.7, I have the Lumix 20mm F/1.7 pancake (another great lens), but the 40mm field of view isn’t for me, and I find myself swapping down to the Lumix 14mm F/1.5. When I tried the 25mm F/1.7 which is a 50mm field of view, I got comfortable with it. I feel it’s just the right focal length. That is why it’s the lens attached to the E-M5 most of the time. In the past year, I slowly learned to appreciate prime lenses, it forces me to slow down and think and take a close look at scene. Again, I’m going back to basics, I’m learning to frame in a different manner, I’m learning to compose my shot in a different way than I was accustom. I’m not ashamed to admit, but it’s true. This is the reason why I started this project. I want to see what I can come up with using one lens a week. I used three accessories on my E-M5, the OP/TECH USA 6701062 SLR Wrist Strap (Black) , Grip Base For E-M5 by J.B. Camera Design and the Camera Hanger Belt Clip Holster Holder attached to the grip. This allows me to carry my camera easily in my waist when I’m walking around and the wrist strap allows me to secure my camera on my wrist when holding it. Anyway, on to the camera hardware and lens. Coming from an E-PL1 the E-M5 is way more advance, in terms of in body stabilization, handling, performance, frame rate, you name it. Even comparing it to my Canon EOS 7D Mark I, the E-M5 is just very pleasant to use. See the Specs below. Yes the E-M5 is a great camera in most aspects, but still behind in terms of Continous Auto Focus, like most mirrorless cameras of that generation. I cannot rely on it’s continous AF when shooting action sports or even fast moving subjects. When using the E-M5 to shoot fast moving subjects I find that it’s better to shoot in Single AF and practice following the subject or mark a point in the frame and just wait for the subject. This works better for me, because the single AF of the E-M5 is fast and accurate. Now how about the image quality? Yes, you can get great, or even excellent images with it. But like any other cameras that I have used, it still boils down to the quality of lens that you use. Don’t get me wrong, the kit lens (14-42mm) is ok in most situations, but if you want better quality images, you have to upgrade your lens or add some of the great prime lenses available for micro four thirds. One of those lenses is the PANASONIC LUMIX G Lens, 25mm, F1.7 ASPH . I bought this lens back in 2015 at a sale price. I’m telling you it’s a lot of lens for the price. It’s been a year now and I can say that it’s a great lens, it’s sharp even at F/1.7 and gets even better at F/4. Most of the time I shoot with it wide open and I don’t see any problem with it. I don’t have any charts or scientific proof for this, just photos that I shot in the past year. Performance wise, it’s a dependable lens, I find the AF fast and accurate, but not as fast as my Olympus 45mm F/1.8, and is way faster than the Panasonic 20mm F/1.7, it’s also faster than my Panasonic 30mm F/2.8. It has a closest focusing distance of 25cm / 0.82ft and a maximum 0.14x magnification rating. If you are looking for a lens for your micro four thirds system, you can take a look at the PANASONIC LUMIX G Lens, 25mm, F1.7 ASPH , you won’t be disappointed, also if you are in the market for a cheap micro four thirds body, the Olympus OM-D E-M5 16MP is still a great choice in 2017, it’s cheap, running at around $350, it’s great camera body, very tough with weather sealing fast af, great image quality, what more can you ask for? This entry was posted in Photography Gear Reviews and tagged in 2017 Daily, gear friday, micro43 lenses, olympus, panasonic, Photography Gear Reviews, review.